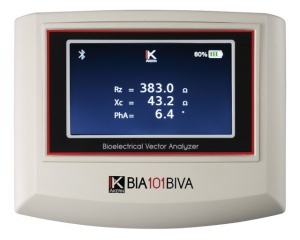 BIA 101 BIVA - Akern Bioimpedance Measuring Devices - Products - SMT medical GmbH & Co.
For decades, BIA 101 served as the legendary pioneer in Bioelectrical Impedance testing. More than 1,500 scientific publications in every imaginable application and field, helped shaping its outstanding reputation in nutrition, clinical medicine and science. Now the novel BIA 101 BIVA emerged as the evolution, based on vast technological and methodological experience in evaluating nutrition, muscle, and hydration states. BIA 101 BIVA features an energy saving 5.7 inch color display. The built-in lithium-ion battery ensures an uninterrupted operation of up to 16 hours, with a full charge resulting in up to 500 patient tests. The integrated Bluetooth makes data transfer fast, easy, and convenient. SmartCheck: An integrated self-check module enables the functional calibration of the sensor and reading of battery charge and status. The user-friendly auto-off switch avoids unnecessary energy depletion. Its super compact and ergonomic form factor, combined with a weight of only 600 grams, make BIA 101 BIVA an ideal companion in mobile, bedside, and lab applications. Imposing an extremely low testing current, the newly designed electronics extend BIA analysis to patients wearing pace makers and during pregnancy. High signal resolution and exceptional accuracy guarantee reproducible and reliable results, well suited for clinical studies and research applications. Offering save and reliable connections, the integrated Bluetooth module transfers data ultrafast and convenient to the Bodygram PLUS software for instantaneous evaluation and interpretation. 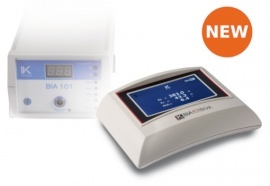 The phase sensitive BIA 101 BIVA measures Resistance (Rz) and Reactance (Xc) of human tissue by a low-voltage, non-susceptible current, yielding reliable test data and results within seconds. Phase angle and body compartments are derived by the Bodygram PLUS software through medically validated algorithms. Concise but impressive reports and narrative interpretations are available to the professional user, patients and clients. An integral part of the Bodygram PLUS software, Biavector® und Biagram® are indispensible clinical tools allowing an at-a-glance analysis of nutrition and hydration states as well as therapy follow-up. While the determination of body compartments depends on entered co-predictors such as weight, age, and gender, Biavector and Biagram represent results based on reading of bio-electrical data only. This clinically validated and meanwhile widely practiced method facilitates body analysis also under difficult conditions, e.g. in obesity, nephrology, oncology, and cardiology. With BIA 101 BIVA and Bodygram PLUS, weight changes can be interpreted easily, and modifications of fluid, cell or fat compartments are reliably indicated. BIA 101 BIVA is particularly suited to follow hydration states in hemodialysis, to analyze emergency and ICU conditions, as well as optimize nutritional or physical activity programs. Operating BIA 101 BIVA is simple: Special skin electrodes are placed on the hand and foot of one body side, connected to the instrument by electrode cables. Resistance, reactance, and phase angle are immediately displayed on the device and transferred via Bluetooth into the BodyGram PLUS software on your PC. Medial device, CE 0051, class IIa according to directive 93/42/CEE, EN60601-1-2, EN46000, EN55011, ENV50140, IEC 1000-4-3; Class 2 BF type unit, with internal power supply. BIA 101 BIVA is a product of Akern bioresearch srl, Pontassieve, Florence, Italy. Windows® is a registered trademark of Microsoft Corp.